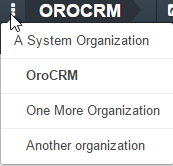 OroCRM Enterprise Edition allows the creation of multiple organizations within one OroCRM instance. There may be any amount of organizations within one OroCRM instance (the system) and one user may belong to several organizations. When an organization is created, you can set it as a system organization. While non-system organizations have separate access and permissions as described in the Access and Permissions Management guide, a system organization enables managing (view, create, edit, delete and assign) entity records in all organizations within one OroCRM instance. Such permissions are granted to users that have been assigned a role, for which the action access is set to “System”. Any other permission setting but “System” defined for a role, in a system organization, will be treated as “None”. If there are several organizations available to a user, this user can switch between the organizations. To switch to another organization, click the selector in the top-left corner and choose the organization. The system organization (if any) is shifted left related to the other organizations. The organization you are currently logged into is displayed in bold. Once a user has chosen a non-system organization, all the new records will be created within this organization.